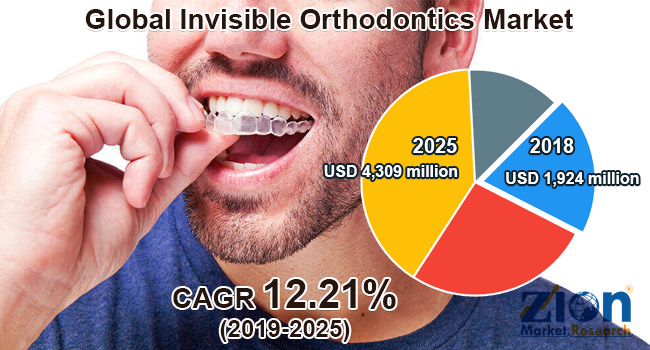 Global invisible orthodontics market expected to generate around USD 4,309 million by 2025, at a CAGR of around 12.21% between 2019 and 2025. A wide section of the population doesn’t consider having braces to be a good idea, but invisible braces have entirely changed their thought processes. The report covers a forecast and an analysis of the invisible orthodontics market on a global and regional level. The study provides historical data from 2016 to 2018 along with a forecast from 2019 to 2025 based on revenue (USD Million). The study includes drivers and restraints of the invisible orthodontics market along with their market impact over the forecast period. Additionally, the report includes the study of opportunities available in the invisible orthodontics market on a global level. In order to give the users of this report a comprehensive view of the invisible orthodontics market, we have included a competitive landscape and an analysis of Porter’s Five Forces Model for the market. The study encompasses a market attractiveness analysis, wherein all the segments are benchmarked based on their market size, growth rate, and general attractiveness. The study provides a decisive view of the invisible orthodontics market by segmenting the market based on product type, patient group, end-user, and region. All the segments have been analyzed based on present and future trends in the market are estimated from 2019 to 2025. Based on product type, the market is segmented into ceramic braces, clear aligners, and lingual braces. Based on the patient group, the market is segmented into adults and teenagers. Based on end-user, the market is segmented into hospitals and dental and orthodontic clinics. The regional segment includes the current and forecast demand for North America, Europe, Asia Pacific, Latin America, and the Middle East and Africa with its further divided into major countries including the U.S., Canada, Germany, France, UK, China, Japan, India, and Brazil. Some key players of the global invisible orthodontics market are Align Technology Inc., Danaher Corporation, Institut Straumann AG, 3M, Dentsply Sirona, Great Lakes Dental Technologies, Henry Schein, SCHEU-DENTAL GmbH, TP Orthodontics, and K-Line Europe GmbH, among others.